This striking performance opened the fourth Bay Area Art and Science Interdisciplinary Collaborative Session (BAASICS.4) at ODC Theater in San Francisco on January 18th. It was an evening of presentations by artists and scientists—many of whom blur the distinction—about the San Francisco Bay Delta Watershed. Watersheds are a type of geographic organization—but that makes them sound so (if you’ll forgive the expression) dry. They are tapestries of interwoven lives—that’s better. All life depends on water, and all water flows to the sea. A watershed contains all the land whose rainfall eventually joins the ocean at a single outlet: for example, under the Golden Gate Bridge. 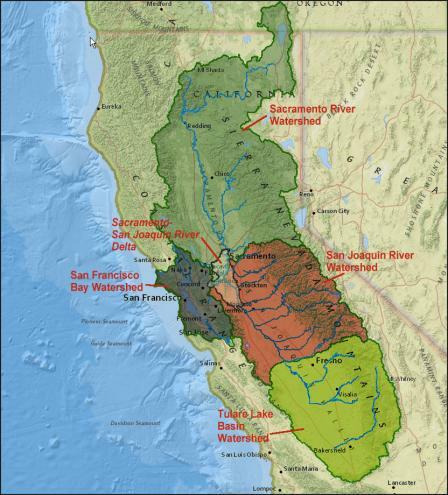 The San Francisco Bay Delta watershed (so named because the waters of the Sacramento River and the San Joaquin River pool in an inland delta before flowing out to the Bay) is enormous. It stretches from Oregon to Bakersfield. It has also been enormously altered, from the days of industrial gold mining to the re-engineering of the Central Valley for large-scale agriculture. Like so many other Bay Area residents, I enjoy reservoir water, Central Valley crops, and hydroelectric power. But we also all suffer from unintended consequences: groundwater pollution, loss of waterbirds and salmon, increased susceptibility to climate change. 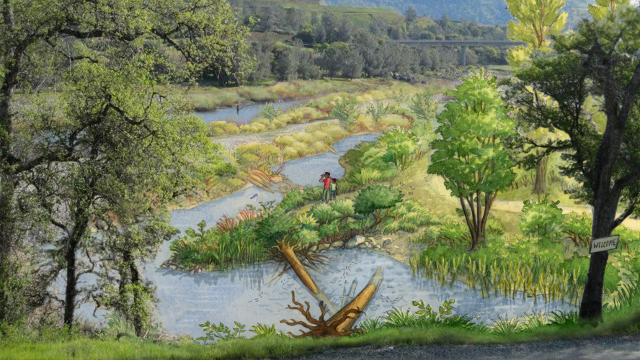 A view of Englebright Dam, on the left, and what the area could look like without it by Mona Caron. Volunteer, non-profit and government efforts have done a great deal to restore the watershed, and they aim to do more. But according to Derek Hitchcock, an ecologist with The Watershed Project, “Cultural healing is needed before watershed healing." Having worked extensively with indigenous tribes, whose very language "evolved out of the place itself," Hitchcock sees a need for the non-indigenous people of the Bay Area to plant their roots more deeply, to really inhabit the land and engage in "genuine long-term stewardship." Art can fuel such a cultural shift. Cronin’s work, for example, turns intellectual concepts into intimate connections, awakening in us a love and a reverence for the water we all share. And the work of watershed sculptors Daniel McCormick and Mary O'Brien actively restores the environment. 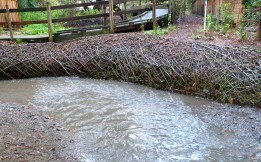 Their installation "Thicket," an elaborate weaving of live native willow, is currently healing Adobe Creek in Los Altos' Redwood Grove Nature Preserve. The creek bed is dry right now, so you can walk over the gravel-strewn floodplain and touch the green branches that whip out enthusiastically, bearing the first buds of spring. Over the years, Thicket will accumulate silt and organic debris, composting it to feed the native plants as they grow and anchor the stream bank. Eventually, the shape itself will disappear--but its ecological impact will remain. After a century and a half of environmental damage, projects like Thicket are restorative to our spirits as well as to the watershed. "Humans are an inseparable part of the ecology," says Hitchcock. "Our psychological and spiritual well-being are a piece of watershed health."